There are several ways to celebrate Valentines day: a romantic dinner, a valentines concert, an out of town getaway, a surprise gift. But even the simplest of gestures can make an impact as big as the others: a stroll at the park, a dedicated poem, a valentines card, a bunch of roses or even a simple sincere prophecy of an "I love you". With the advent of technology and the internet, expression of thoughts and messages have been cut down to very simple methods: searching the net for love quotes or romantic photos and e-mailing the link, sending a hug or kiss via a facebook application, sending an e-card with an automated e-mail, posting a tweet or plurk exclaiming your feeling or simply going online to chat with your loved one. As much as they all seem hi-tech, they require very little effort and they only exist online. In special occasions like these, it's far more appropriate to show more effort in expressing your feelings than just sending electronic data in the form of lovenotes. The good thing is you can still be hi-tech and make your presence felt both online and offline with IslandRose.net. If you love being online and using technology to your advantage but want to make your loved one feel special and affirm your offline presence as well, then you can visit IslandRose.net and send a gift to your special someone. 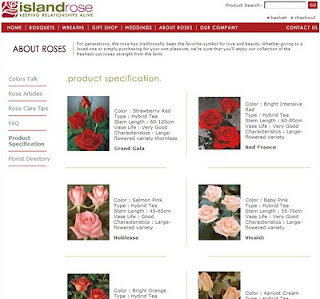 As its name suggests, Islandrose's specialty is roses. Send roses of any color, kind and quantity to the person special to you. These are nowhere close to ASCII art roses (remember this ? @};-'-,---- ) or a photo link of a rose. These are real, homegrown, high-quality roses that islandrose.net will deliver to your loved ones. You can choose from a variety of roses and customize them through their user-friendly online store. Everything can be done online from the rose selecting and delivery instructions up to the online payment as they accept all major credit cards. What's more convenient is that they deliver to any point in the Philippines. So even if you're thousands of miles away in another country, you could still make your presence felt and send flowers to the Philippines through IslandRose.net. Aside from roses, they do offer chocolates, fragrances and other similar items suitable to trigger feelings of love so aside from sending roses, you can send gifts to the Philippines from anywhere in the world. Let IslandRose be your flower delivery to the Philippines. A few years back, I've personally ordered a long-stemmed rose via islandrose.net and I was very pleased with the rose and box it came in. It even had a tube filled with water at the end of the stem to maintain freshness for a longer period. I couldn't have selected a better way to send it. May it be for the fast approaching day of Cupid or for any other special occasion, consider sending your roses via http://www.islandrose.net. As a special offer for Valentines Day, you can use this code VDAY022010 to get a 10% discount. This discount code is valid until February 20, 2010. Happy Valentine's Day !